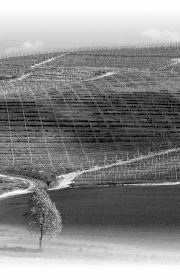 Vineyards in Barbaresco (about three hectares), at the foot of the Socré farm, constitute the center and heart of the company. They are placed in a splendid panoramic position, about a kilometer before the hamlet Tre Stelle of the village of Barbaresco, coming from Alba. 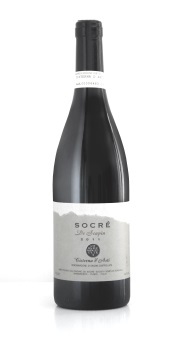 The subarea mention of our estate is all named Roncaglie. The position of the land is declivous, with slopes from medium to high; exposure is between south and west; altitude between 250 and 290 m a.s.l. . Here, in addition to our winery, we grow most of our wine grapes. Until the early twenty-first century, we kept also some Dolcetto and Barbera vineyards planted in the sixties and seventies. Following the reorganization of production in the company that took place in the twenty-first century, on this land we exclusively grow Nebbiolo. Barbaresco (CN) is located 4 km linear distance northeast of Alba (8 on the road) and 50 km southeast of Turin. Altitude: 255 m a.s.l. at the village center. 270 at our farm. Barbaresco is a relatively small municipality and it is characterized by scattered houses and tiny hamlets. Its landmark is its medieval tower. At main village center, where there is also the town hall, there is also the church of San Donato, now deconsecrated, which has been restored and adapted for regional wine. Below the beautiful frescoed vault, this former church now houses the exhibition of ethnographic material and stands of bottles. Soil composition is in majority clay, with a limestone base and a marked alkaline reaction. Stratified marl-clay and silt derived from an ancient seabed form the whole texture. This seabed was deposited by currents of finely murky waters, in an ocean of 50 million years ago. The sea bottom later raised and Quaternary alluvial deposits mixed into the scattered microzones that we find today. In the steepest vineyards, in gray-blue tuff, stones of Langa outcrop. The characteristic gray-blue color is due to that original seabed, sedimented in the absence of oxygen. Stones of Langa, on the other hand, are traditionally used in local architecture. Asili, Ca Grossa, Cars, Cavanna, Cole, Cortini, Faset, Martinenga, Montaribaldi, Montefico, Montestefano, Muncagota, Niccolini, Ovello, Paje, Pora, Rabaja, Rabaja-Bas, Rio Sordo, Roccalini, Roncaglie, Roncagliette, Ronchi, Secondine, Tre Stelle, Trifolera, Vicenziana.